Senator Marco Rubio, a leading contender to serve as Mitt Romney’s running mate, has a surprisingly centrist foreign policy vision according to his address at the Brookings Institution last Wednesday. Florida’s junior senator sees a world of complex, transnational threats that make it impossible for the United States to hunker down in an isolationist crouch. He recognizes the need for international partnerships. He’s in favor of foreign aid and the defense of human rights. And he believes military force should always be on the table in defending U.S. security. Senator Rubio, meet Barack Obama. GOP critics and their op-ed and think tank allies routinely paint Obama as a foreign policy naïf—an appeaser, a peacenik, and worse. They conveniently overlook, as Peter Bergen recently pointed out, that the president has authorized the most intense counterterrorism operations in U.S. history, to say nothing of a victorious coalition operation that deposed Libyan dictator Muammar al-Qaddafi. (The president even used his Nobel Peace Prize acceptance speech in 2009 to justify the use of military force in a world of evil-doers). One might have expected Senator Rubio to descend into caricature of Obama, and launch into a full-throated defense of American unilateralism. Refreshingly, he instead outlined a strategy of pragmatic internationalism. So what did we learn from Rubio? Multilateralism reflects enlightened self-interest. As the president himself has done, Rubio lionized the generation of far-sighted wise men who had “a vision, the will and the means” to create and defend liberal norms and principles of world order after World War II. To be sure, Rubio tried to force some daylight between him and the president. He criticized Obama for unsteady leadership in catalyzing global cooperation, for placing undue faith in rising powers, and for overreliance on formal multilateralism. On each of these counts, Rubio’s indictments were unpersuasive. Rubio’s main critique was that the Obama administration has too often substituted a pusillanimous “engagement” strategy for true leadership. 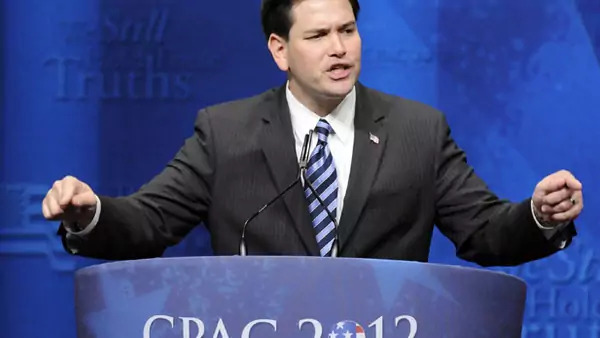 He condemned the administration for failing to understand that “ effective coalitions don’t form themselves…and more often than not, they can only be instigated and led by the United States.” But Rubio’s supporting evidence was weak. The closest he could come was in chiding the administration for taking the slow route to victory in Libya—but even then, he had to concede that the coalition approach had succeeded. The problem with this formulation, of course, is that mere assertions of U.S. leadership are no longer enough to secure followers. Compromises must be made, and deals must be cut. The United States cannot simply rely on “like-minded nations.” To address climate change, nuclear proliferation, and a host of other global issues, the United States has no choice but to engage China, as well as other major players like Russia, India, Brazil, and Turkey. Finally, like other Republicans, Rubio perceives a slavish Democratic devotion to formal international organizations. He charged that American power has been “diminished” by the “one nation, one vote formula of the UN General Assembly or the Human Rights Council,” with “absurd and often appalling results.” Nor is Rubio impressed with Obama’s efforts to forge consensus on the UN Security Council, since, “as we have seen on North Korea, on Syria, on Iran,” that body is too often paralyzed by veto threats from China and Russia. This critique is simply a bum rap. The Obama administration has never limited multilateral cooperation to working through formal institutions, and it has made pragmatic use of coalitions of the willing. Where the Obama administration differs from its predecessor is in working assiduously within universal membership bodies—including the flawed UN General Assembly and Human Rights Council—in an effort to reform these from the inside out. Finally, Rubio’s critique of the Security Council has little to do with the Obama administration, per se—it’s simply a structural function of the UN Charter’s veto provisions. What Rubio neglects to mention is that the administration, despite the inherent limits of the Council, has achieved the strongest sanctions resolutions ever on both North Korea and Iran. In other words, before arming an inchoate rebel force in a looming sectarian war in the heart of the Middle East, we should probably know who we are dealing with. Such circumspection sounds strangely familiar….